Permits and Zonings and Signs…Oh my! Sign codes and zoning ordinances are often a surprise to our customers. Everyone wants the largest, brightest sign so they can be seen easily during the day and night. But did you know that each city, county and even the commercial development you are in have restrictions and codes that dictate what type of sign, size and sometimes the colors you can use? Over the years, I’ve had to explain sign code to customers. I had to be the bearer of bad news as to why they couldn’t have a certain size sign, type of sign, quantity of signs or have it in a particular location. There were several times when I filed a variance to have the City reconsider their sign code and approve the sign. In one situation, the city required that the property include a retention pond for the 100 year flood. Then after the pond was added, the business owner was told that now their property acreage went from 5 acres to 3 acres and the size of their sign was reduced by 60%! We had to apply for a variance to resolve this situation. And I can tell you the customer was not happy! Another time a road expansion raised the street above the business. They were now “cliff dwellers”. Their sign was below the road and did not provide any value to their business. Again.. a hardship variance was applied for to allow them to have a 40 foot pylon installed so their sign was above the roadway. I’ve always been sympathetic with my customer’s concerns and frustrations with permits and zoning limitations. But never did I know how frustrating being denied a sign was until it happened to me. 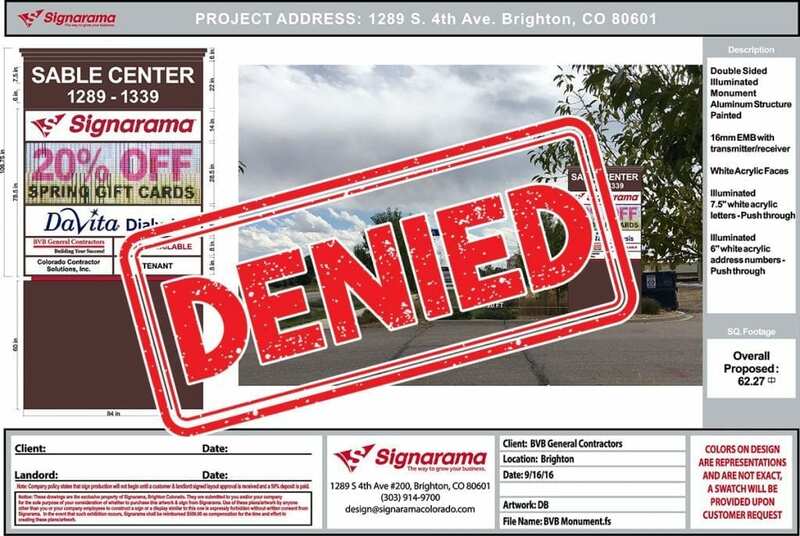 When I first looked at the “denied” stamp on my sign submittal, I thought it was a joke. How could they not approve the sign? It was a nice looking monument; fit the area and denying the permit made absolutely no sense. I called the person who rejected the application, still thinking he had made a mistake. But he told me, in a rather condescending way (because I’m the Sign Lady and should know the code), that the sign didn’t meet the criteria. Now, don’t get me wrong, I do believe that sign criteria is important. You want a community to have nice looking signs. There needs to be some uniformity. But to have a sign code that is so limiting as to deny a company visibility from a main road is unacceptable. What created my frustration is there is a new building going up in front of us. We are completely blocked from the street. When over a dozen customers are calling us from the King Soopers because they “can’t find us”, well… that’s a hardship! Permits and Zonings and Signs… Oh My! Follow the road to city hall. This saga isn’t over… to be continued.